Lenovo created a balanced bundle. Recently, the Y50-70 proved to be a good entry into the mobile gaming world. Now, the manufacturer put even more performance into the slim case and improved the bundle. The most important change: Lenovo replaced the predecessor's poor TN display with a good IPS panel with 1080p resolution and matte surface. 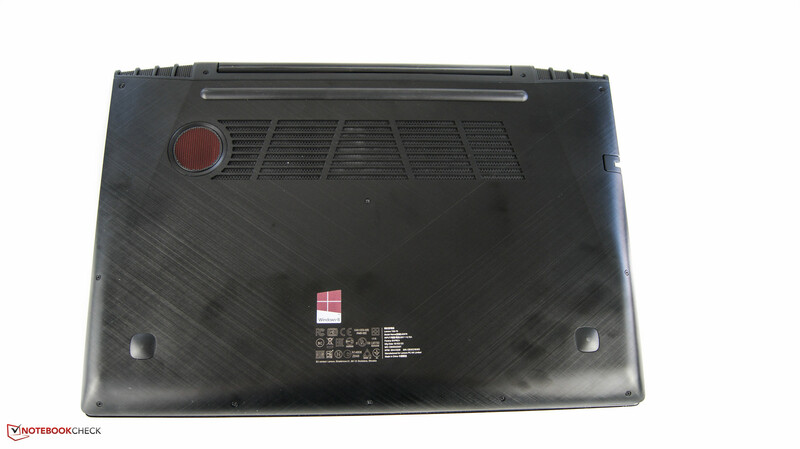 Although the input devices remained largely the same, we have to cover the touchpad again. It already had slight issues in the previous test. In our model, the incorporated mouse buttons only worked when pressing extremely hard. Despite a click noise often no mouse click is triggered. We cannot tell here whether our test model is defective or whether the whole series is affected. Our test model comes with a Full HD display. 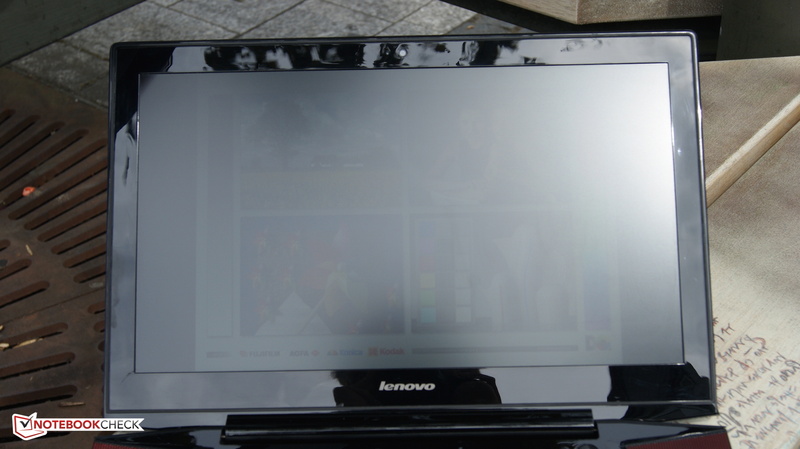 It features a 1920x1080 resolution and stems from Samsung (model 2014: Chi Mei). The average brightness is 226.7 cd/m². The competitors are brighter. It is positive that IPS technology is used. Thanks to the matte surface, gloss is not a limiting factor. Those who want a sharper display can select the optional Ultra HD (see review) instead. The contrast of 930:1 and the black value of 0.23 cd/m² are completely sufficient for saturated and deep black. In comparison, the model from 2014 only achieved a contrast of 315:1 and a black value of 0.722 cd/m². While the Schenker XMG A505 performs better in all aspects, it costs 350 Euros (~$387) more. 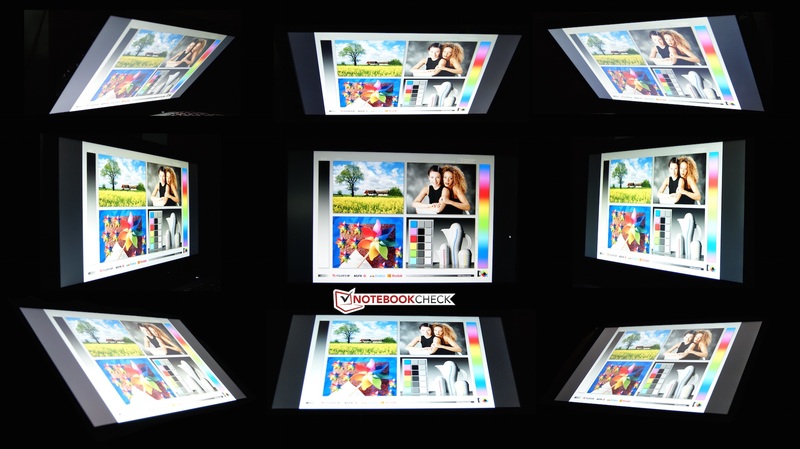 Due to the IPS technology, the color shift (compared to sRGB) and the gray level shift are sufficiently low. 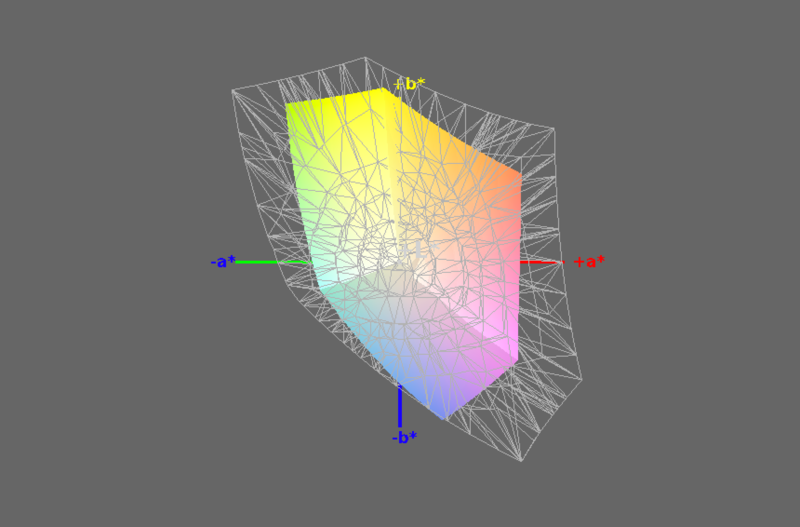 Before calibration, the DeltaE value is 4.9 for the colors and 3.24 for the gray levels. Even without calibration a blue tint is not visible. This is another aspect which significantly improved compared to last year's model. Color-space coverage is an important criterion for professional use. However, only 59% of sRGB and 38% of AdobeRGB are covered. Next we want to check the outdoor capabilities. Although the brightness is rather low, direct light sources do not disturb thanks to the matte display. 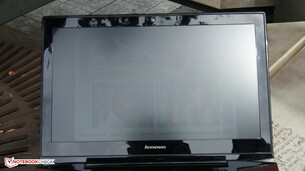 Nevertheless, the brightness is hardly sufficient for constant outdoor use, since the image is often too dark. The IPS display is much more pleasing in terms of viewing angles. Tilting the screen and looking at it from the sides is always possible. For example, several people can watch films etc. from different positions without limitations. 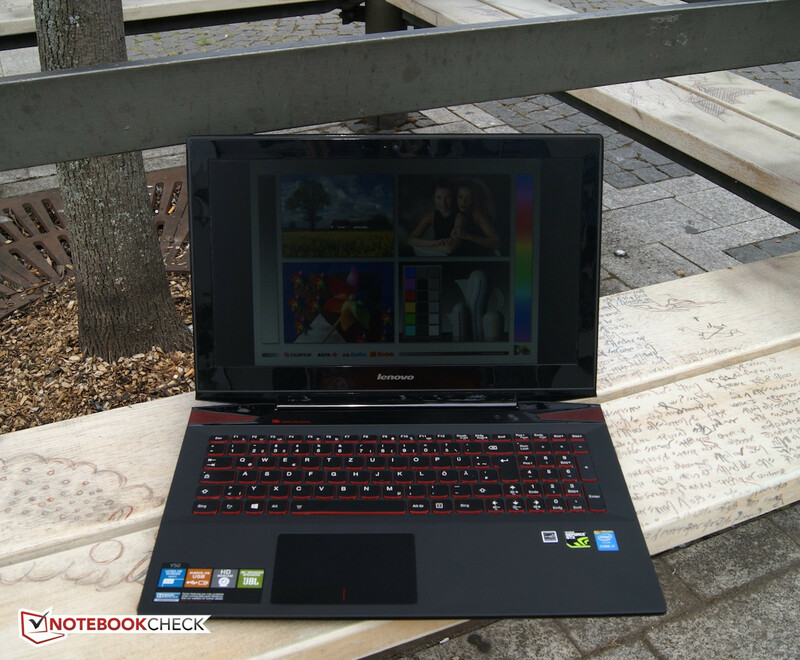 The Lenovo Y50-70 is a responsive multimedia device with an SSD, 16 GB dual-channel RAM, a fast CPU and a powerful dedicated graphics card from Nvidia. 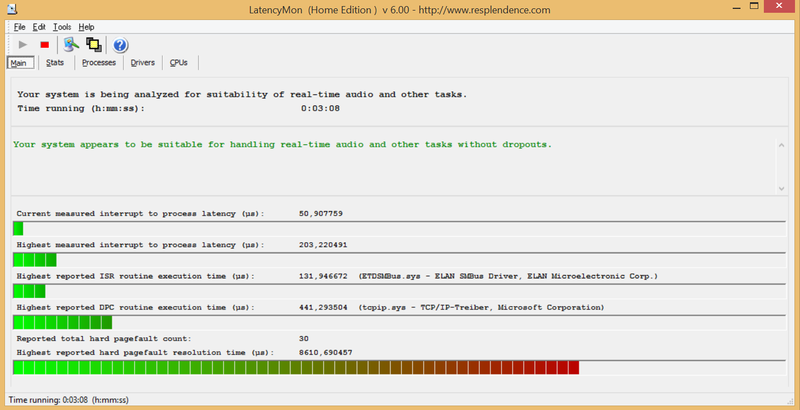 A glance at the specs reveals that our test model can easily cope with multimedia tasks and can even handle games. Most newer games will run at a high quality level. Thanks to its slim build, the Lenovo is also a welcome companion. As mentioned above, those who need slightly more performance can select a faster processor. A "10" in the name of the Intel Core i7-4710HQ indicates the first new feature. The data sheet reveals the difference with the Intel Core i7-4700HQ used in the previous model. Base clock and Turbo clock were increased by 100 MHz. As a result the clock rate ranges from 2.5 to 3.5 GHz. Cache size and TDP of 47 W remained unchanged. Both CPUs are based on the Haswell technology. The Intel Core i7-4720HQ is another option and clocks another 100 MHz faster. We want to analyze the performance difference of the three processors with Cinebench R15. In the multi-core test, the new CPU performs hardly better than the already reviewed Y50-70. The performance gain of the Intel Core i7-4720HQ might be worthwhile as we can see in the MSI GE60 and the Acer Aspire VN7. However, a similar Y50-70 with Nvidia GTX 860M performs only 6% better. This is most likely due to Turbo efficiency. The clock rate falls to the standard clock of 2.5 GHz at the beginning and the laptop does not run at Turbo clock. The clock rate does not fall below 2.5 GHz when the test is run multiple times in succession. A CPU performance loss is not to be expected on battery. 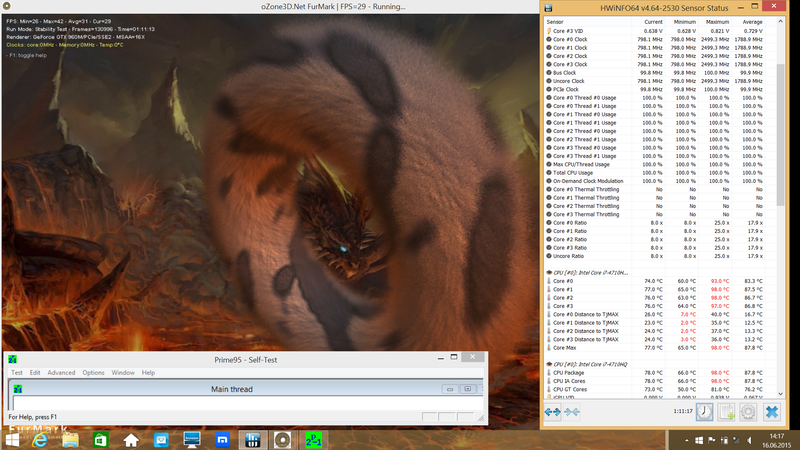 At least, the laptop achieves the same score in Cinebench R11.5 as in mains operation. An SSD, a high-performance processor, sufficient RAM as well as graphics performance always ensure smooth and responsive operation. Working is absolutely fun with our test model. PCMark 7 confirms our subjective impression. 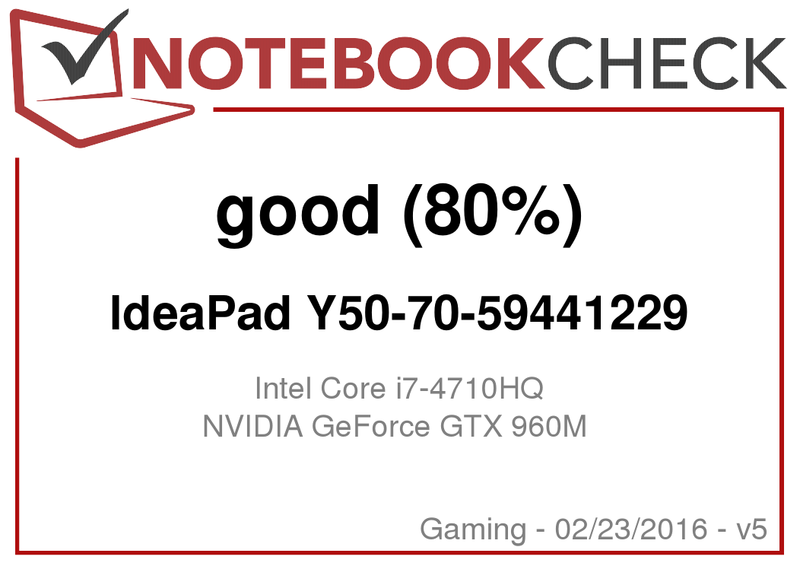 Compared to our previous review, the Y50-70's score is above 50% higher. Not only the faster hardware is decisive, but also the use of a fast SSD instead of a magnetic hard drive improves things. 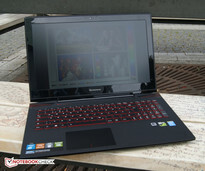 For the same reason, the similarly equipped MSI GE60 achieves 1000 points less than our test model. In our configuration, the storage device is a Samsung PM851 with 256 GB. We used CrystalDiskMark to evaluate its performance. It achieves decent sequential read rates of above 500 MB/s, which is about five times the predecessor's. The sequential write rates of 264.8 MB/s are about three times faster. Thanks to SSD technology, the especially important 4K values are much better. This year's Nvidia GTX 960M is significantly more powerful than its Nvidia GeForce 860M predecessor. Our model comes with the maximum VRAM capacity of 4 GB. We want to analyze the performance gain compared to the predecessor with 3DMark 11 and FireStrike. In 3DMark 11, the performance gain is about 7 to 8%. The difference is even higher in the 3DMark FireStrike test with 9 to 12%. However, it is questionable if buying a new notebook is indeed necessary. But, we can say for sure that the performance falls on battery. So, mains operation is necessary for having the full potential of the dedicated graphics card available. 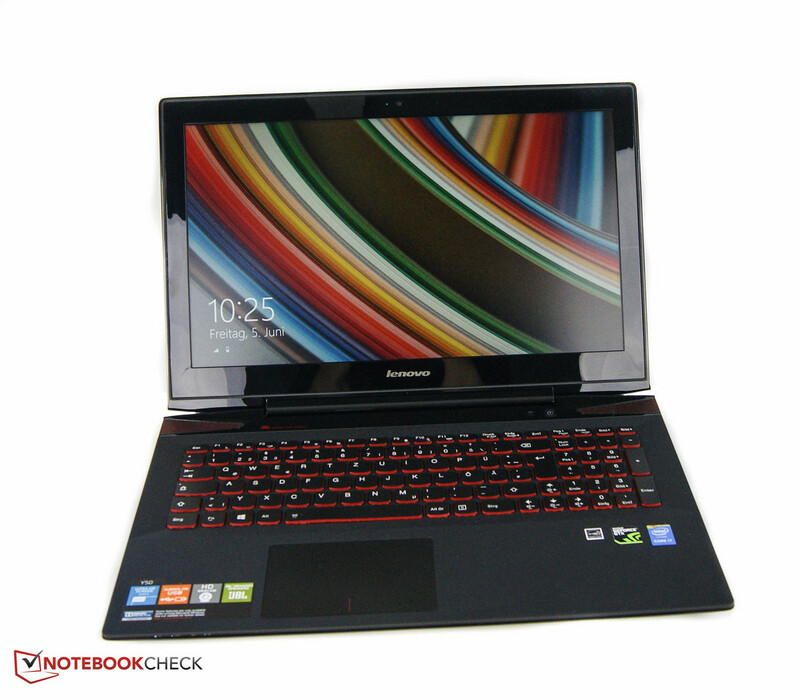 With the used dedicated graphics card of the performance class, the Lenovo Y50-70 is perfectly suitable for gaming. Most games should be playable at high quality settings without big problems. We selected Metro: Last Light as a representative, since it shows the potential of the graphics solution and allows comparison to our last year's review. Smooth frame rates are possible with maximum graphics settings, while last year's Y50-70 achieved an unsatisfactory 24 fps with the same settings. The Y50 deserves praise in terms of system noise. While idle, the test model always remained quiet. Most of the time, the device is even silent and the fans are off. A noise of up to 47.6 dB(A) is first possible in load scenarios. The reached frequencies are not disturbing. Especially while idle, the new Y50-70 is quieter than the already reviewed model. Competitors like the MSI GE 60 are significantly louder, too. Let's turn to the temperature development of the case and hardware. While idle and during normal use, the case remains comfortably cool. We could not observe abnormalities during our tests. Quite uncomfortable temperature peaks are first reached when the components are used to capacity. Unfortunately, the maximum of 52 °C is on the top side. The previous Y50-70 got even 8 °C warmer. Overall, these temperatures are uncomfortable for work, but they are only reached during our stress test. We checked the effects of FurMark and Prime95 on the inner components. After a short time, the clock rate falls to the base clock and remains there until the CPU clock has to react to enormous CPU temperatures of up to 98 °C. After a short time at 800 MHz, the clock rate increases to the base clock again. Those who frequently run demanding programs should also watch the temperature of the power adapter, which reached a maximum of 55 °C. For this reason, the power adapter should not be covered by pillows or blankets. We reran 3DMark 11 immediately after our stress scenarios. With about 5400 points, the score is equivalent to a cold run's. (±) The average temperature for the upper side under maximal load is 37.1 °C / 99 F, compared to the average of 32.9 °C / 91 F for the devices in the class Gaming. (-) The maximum temperature on the upper side is 52.5 °C / 127 F, compared to the average of 39.3 °C / 103 F, ranging from 21.6 to 68.8 °C for the class Gaming. (+) In idle usage, the average temperature for the upper side is 24.8 °C / 77 F, compared to the device average of 32.9 °C / 91 F.
(±) The average temperature of the palmrest area of similar devices was 28.7 °C / 83.7 F (+2 °C / 3.6 F). According to our readings, the battery features four cells and a capacity of 55.5 Wh. If you believe in the manufacturer's claim, the battery life should be up to 5 hours. For a scenario as realistic as possible, we set the brightness to about 150 cd/m² and simulate web surfing. The Y50-70 switches to stand-by after 4 h and 14 min. While the laptop will not last a workday long, watching several episodes of various series is easily possible on a single charge. Lenovo's bundle can still be called solid. An elegant and fancy design envelops the powerful hardware inside, which can easily handle everyday multimedia and gaming. Instead of a TN panel, the IPS technology is now used. Nevertheless, the brightness is very low, but other values including contrast significantly improved. A better resolution is available with the optional UHD. The faster CPU is probably not the deciding factor for replacing the old notebook. The new Nvidia graphics card convinces with about 10% higher performance in the benchmarks and also with smoother frame rates for gaming. Fortunately, the improved performance is not at the expense of emissions. Quite the contrary: low fan noise and surface temperatures are a positive development. However, the battery life remained unchanged. 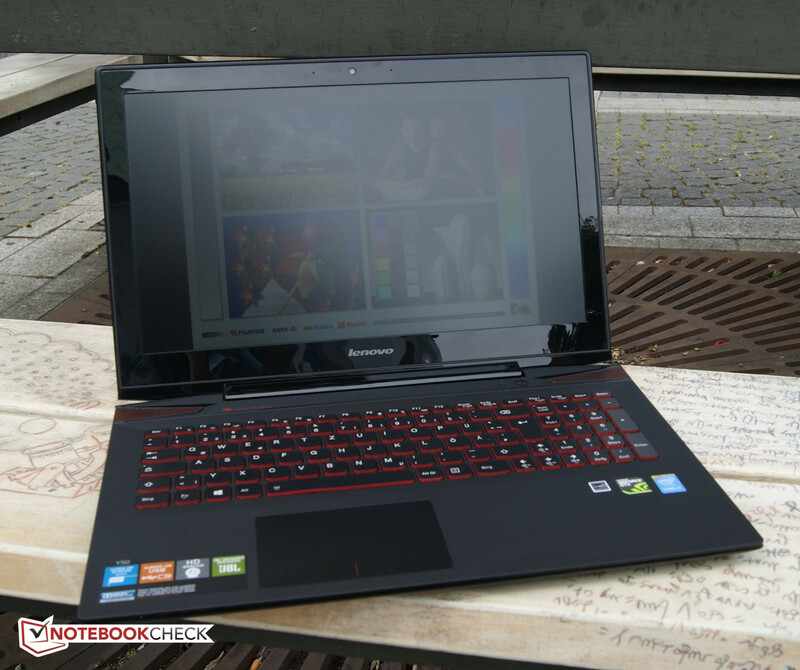 The Lenovo Y50-70 is an interesting multimedia and gaming notebook with an affordable entry level price of about 1000 Euros (~$1106). However, the competition also offers interesting devices like the MSI GE60 or the Schenker XMG A505, which should be considered.